When spending in a foreign country there are lots of different factors to consider, exchange rates might vary widely depending on where you change your money, banks might charge fees for foreign transactions and cash withdrawals, credit cards may charge a different rate of interest when used for foreign currency transactions. For a two week holiday the differences and charges may not add up to much in the grand scheme of things, but no one wants to spend more than they have to and any little bit saved could be used for another drink, a meal or a souvenir. It has taken us a little while to work out our best options for spending abroad, by far the best resource we have used is the fabulous money saving expert. I would recommend you go there too, as the best options are always changing. The holy grail of currency exchange is the Interbank Exchange Rate (the rate at which banks exchange currencies between each other – well ok, it’s the mid point between their buy and sell rates but that’s getting a bit technical) with no additional fees, charges or markups, regardless of the amount being exchanged, the method of exchange or the time and place of exchange. This exchange rate is constantly changing, you can find out the latest interbank exchange rate using an app like XE. Some foreign exchange (forex) companies will offer the interbank exchange rate, but then will charge you a transaction fee, whereas others might offer you a reduced rate. Forex providers obviously need to make profit, and these are the easiest ways for them to do so. Other companies make their profits behind the scenes through a combination of less transparent measures and so can pass on more advantageous rates to the consumer. Some banks will charge a fee for a foreign transaction, this may be a percentage of the transaction fee, a flat fee or even both! Cash withdrawals may also have similar fees. You can find this out by looking at your bank’s website. 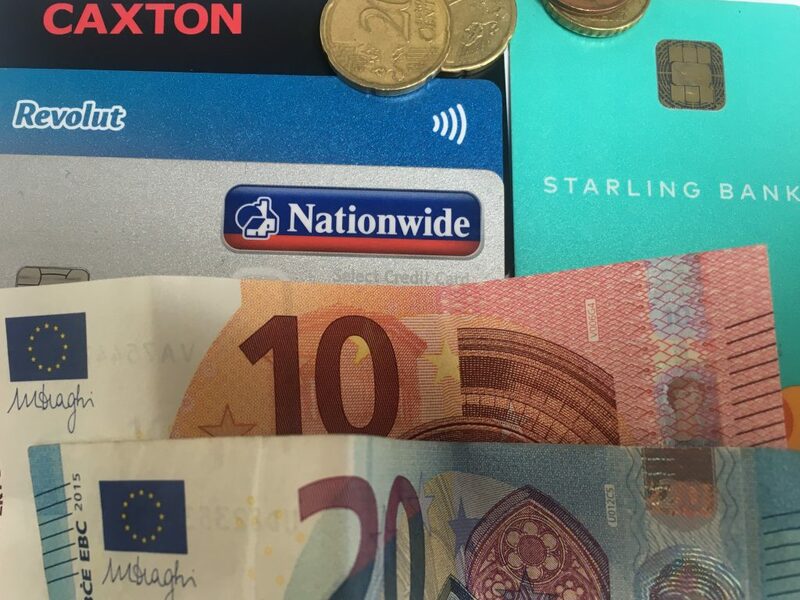 Before we left the UK we had Nationwide and Santander current accounts (we still do) and we never use these debit cards abroad as they both have foreign transaction fees (although you can take fee-free cash out of Santander ATMs and the Nationwide Flex Plus account has fee free cash withdrawals). When using a card always always opt to pay in local currency. If you pay in pounds then you could be subject to any old random exchange rate chosen by whoever is controlling the transaction. You want the exchange rate to be the one you get with your (hopefully fee-free) card. Something you will notice in a lot of European countries (and yes, this does include the UK, although it’s not yet so prevalent) is that fuel stations are rarely manned outside of ‘normal’ working hours. So you have to pay for your fuel at the pump, usually with a card although we have come across some pumps that take cash, particularly in Italy. When you pay at the pump with a debit card the software checks that you have sufficient money in your account to pay, and this done by taking a ‘pre-authorised’ amount which can then be refunded. Our experience is that this has never happened with our credit card, but it has happened with debit cards in the past. Transactions may be declined if the debit card does not have sufficient funds and some UK debit cards don’t work at all. Additionally it can take up to 7 days to refund the pre-authorised amount, this usually depends on the software at the pump rather than your card supplier. We tend to use our credit card for paying at toll booths (although we rarely use toll roads). We have only encountered problems in Portugal where we had random cards declined at some toll stations (it was completely inconsistent). We always managed to pay by card in the end, but sometimes it took a few tries. I would recommend keeping enough cash to hand just in case. Some ways of getting foreign currency will differ based on the country you are visiting. For example some Visa cards will only offer fee free purchases or cash withdrawal in the Visa European zone. In some countries it is much more usual to pay in cash, for example in Italy most people still use cash, even in the supermarket and fuel stations where cards are accepted. Quite a few campsites, cafes and tourist attractions will only accept cash. Other countries may not have such extensive access to ATMs to get your cash. So you may want to top up with cash when you can. This hasn’t been an issue for any of the countries we have been to so far, but we have only been in Western Europe. Some ATMs will charge for a transaction even if you have a fee free card. We have heard reports that this is happening more often in Spain and we know it happens sometimes in the UK. They will always tell you if this is the case so keep an eye open for any messages on the ATM and cancel the transaction if you have the luxury of time to find another cash point. Be aware that specialist currency cards will sometimes penalise you for using your currency card in the UK even though you are able to hold British Pounds. Check the fees and charges. We do a changeover of the cards in our wallets when we get back to the UK, moving back to our usual debit cards and our Tesco Credit card (so that we can save points for things like car hire and channel tunnel crossings). There are lots of ways of getting foreign currency and you will need to decide the best way for you depending on where you are going and your spending patterns. Some cards will set limits on the amount that can be withdrawn per day or even month, some cards can only be managed with a mobile device. Below we’ve described what we do and why, but that’s personal to us. The key thing is not to leave yourself short changed, however you spend money abroad make sure that you get the best exchange rate for you and don’t pay fees that you don’t need to. This is something we no longer do for Euros. We have enough of a float to keep us going and ATMs are everywhere in the countries we have visited so far. But if travelling further afield we may well order some currency in advance so that we have money in our pocket. It’s worth checking whether the country you are visiting requires you to buy anything at the border in local currency (ie vignettes) and making a decision on that basis. If you do want to take cash with you then the best rates are usually obtained by ordering in advance and by ordering larger amounts. The best rates are not found at the airport or ferry terminal unless you have ordered in advance for collection, which can be done for the next day, so not necessarily a bad way of getting your money. Of course you may not want to carry large amounts of cash (it probably wont be insured). The smaller the amount you want to exchange, the less advantageous rate you will get, but the less difference you will find between your options. Credit cards often offer good exchange rates, close to the interbank rates. Mastercard typically offer slightly better rates than Visa or American Express (Amex); see this interesting article comparing the rates. Mastercard and Visa are accepted widely, other credit cards (such as Amex) are accepted in fewer locations. But just because your card has the Mastercard Logo on it doesn’t mean that it will give you the best rate. Credit card providers might offer a lower exchange rate and often have a range of fees. Things to look out for in particular are high fees on cash withdrawals or fees if you don’t pay off your balance. We use our Nationwide Select Credit Cards. They are Visa cards and have no foreign transaction costs on card transactions. Within Visa’s Europe zone they provide the basic Visa exchange rate without any loading. We do not use them to withdraw cash as they have penalties on cash withdrawal. We use our credit card to pay for fuel to avoid rejection at the pumps. We also use it to pay for any large outgoings where we might want the additional protection provided by a credit card – for example when we bought our snow shoes. We don’t use it for other transactions because they take about three working days to show up on our statement and we like to be in touch with our latest spending. We always pay our full balance every month. There are plenty of other credit cards that are as good, some are even better as they may give Mastercard rates, offer fee free cash withdrawals and/or give you cashback on purchases. Halifax Clarity, Barclaycard and Tandem are all cards that feature regularly in the top lists here. We will be looking at alternatives when we next return to the UK, but it will depend on our ability to pass the credit checks as we only have a small income. Although we have both Nationwide and Santander current accounts, we do not use their debit cards abroad as both have transaction fees associated with card payments AND cash withdrawals. Instead we have opted to open a Starling account. This is a current account that is managed entirely via an app – you need a mobile device as it cannot be managed on a laptop. It is easy to apply for as they don’t do any credit checks unless you want an overdraft facility (and when you’re travelling full time but don’t have a retirement income you don’t want to be subjected to too many credit checks). They also don’t need a regular amount to be deposited or a minimum number of direct debits. The app is very user friendly and provides a lot of security features. There are no foreign transaction costs associated with the starling card and up to £300 can be withdrawn each day without penalties. You even earn (a small amount of) interest on any balance you have. Our tip with this card is to make sure there is money in your account while you have internet, otherwise you’ll be standing at the ATM trying to get a signal to load some more money into it. The down side of this card is that you cannot pre load it with foreign currencies to take account of an advantageous exchange rate (it’s very rarely that any of us will be able to predict exchange rate changes though, so in general we just accept the rate we get on the day). It is a sterling account and exchange rates are at the point of purchase (or cash withdrawal). This is a Mastercard debit card so has the advantage of generally better exchange rates. At time of last testing (Sept 2018) we were not able to use this card in pay at pump fuel stations. We use this card for most of our everyday transactions so that we can stay up to date with our spending. Other debit cards such as Monzo and Metro offer similar features. Look out for things like maximum free-free cash withdrawals (on Monzo this is currently £200 per month) and decide on a card based on your type of usage. We have had two pre-loaded cards. Caxton FX and Revolut. These cards have to be loaded with cash before you can spend, there are no overdraft facilities or lines of credit, but because of this they are easy to get hold of as no credit checks are needed. We started out with Caxton FX a few years ago, we weren’t really clear on what was available to us and it was recommended by a couple of motorhome bloggers. It may well have been the best of it’s type at the time. However we started to get disillusioned with the exchange rate. For example, at the time of writing, the exchange rate on Caxton is 1.1158 euros to the pound, whereas the base rate is 1.1418 euros to the pound. The difference may not seem like much, but if you get through a lot of currency it starts to add up. We moved onto Revolut; Revolut offers much better exchange rates except at the weekend where it adds a factor to the interbank rate. So take care not to exchange currencies at the weekend. There is a fee of £4.99 for obtaining your Revolut card which is waived if you apply through the money saving expert link. Revolut does have a limit on the amount of fee-free cash that can be withdrawn (£200/month), but the card can be used for limitless purchases. There is also a limit on the amount of money you can load onto the card each month (£5000). You can either opt to exchange money at a given point if you want to lock in a rate, or you can load with sterling and then Revolut will make the exchange at the time of purchase. The card is managed online using an app so you will need a mobile phone. We use this as a backup card in case of any problems with our credit or debit cards. We also used it to pre-load with currency before the Brexit vote, which proved to be a lucky guess on our part. So that’s how we get our travel money. I’ll leave you with one last plug for Money Saving Expert, the best website to help you make the most of your money. Thanks for this useful summing up. I hadn’t come across the Starling Account and we’ve tended to just take the hit to get cash out and use our credit card as much as we possibly can. Will take a look.